In this post, you will learn which rules currently exist in Jamaica for the use of drones. 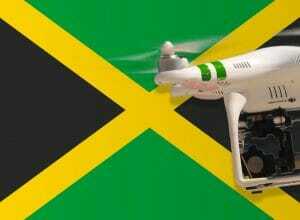 Maximum altitude: In Jamaica, drones can climb up to 120 meters (400 feet). Maximum horizontal distance and FPV: You must fly your drone always within the visual line of sight in Jamaica. The use of a first-person view system is not allowed. The distance between the controller and the drone may not exceed 500 meters. Compulsory insurance: As far as I know, you do not need a multicopter insurance in Jamaica. Nevertheless, we recommend you to buy a suitable policy. Maximum take-off weight (MTOW): No restrictions found. Distance to airports: At airports, flying drones must maintain a distance of 5 kilometers (3 miles). Other safe distances: A drone is not allowed to fly over organized open-air rallies. Such crowds must be kept 150 meters (500 feet) apart. Uninvolved persons must always be at least 50 meters away. Only during take-off and landing may this distance be fallen below. In these situations, a minimum distance of 30 meters applies. Operating times: Multicopter may only be used in daylight in the airspace of Jamaica. Special regulations: In Jamaica, drones must always be equipped with a failsafe mechanism, which automatically causes the aerial vehicle to land when a connection is lost. Commercial pilot rules: Before each flight, commercial multicopter controllers must apply in writing for a Special Aerial Work Permit to the Jamaica Civil Aviation Authority (JCAA). This permit may impose additional conditions. Good to know: Pre-programmed flights are not permitted in Jamaica. We have researched the listed drone regulations for Jamaica to the best of our knowledge. We cannot guarantee the correctness of the information. If you want to be on the safe side, contact the competent aviation authority. Alternatively, you can also ask the embassy in your country for further information about the regulations. Please leave us a comment when you receive news and/or gain experience with your copter in Jamaica! Nice Blog, very handy as i have some questions about Jamaica Drone Law. I make and fly fast 220mm 4S racing Acro Quads, i use fatshark goggles and fly FPV only, from the look of your blog it looks like FPV is not permitted? Is FPV totally banned? i was going to take my quad on holiday to Jamaica next month.